Our Twilight Talks began in 2014 and is a series of evening Design Discussions inviting contemporary makers, designers, curators and researchers to explore the role and context of design in contemporary Scottish cultural life. With this series we have sought to bring together expert speakers and impassioned audiences to highlight how Design can influence our sense of ourselves, our communities, our economy and our environment. How do Craft and Design skills define a place? Can Craft and Design tradition enable new creative Industry? Three intriguing speakers with complementary stories representing Scotland, Ireland and The Netherlands join an expert chair to debate these questions. 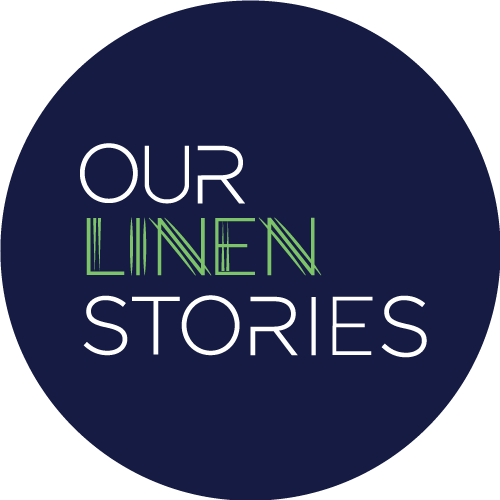 Introduced by Dr John Ennis, curator Our Linen Stories, producer GP Journeys in Design. There will be time for networking after the event with our chair and speakers. We are honoured to present new work by Linda Green, Scottish Artist, to mark this Twilight Talk. Designer, Educator and Cross-disciplinary innovator. While at University of Derby (1973-2003) and University of South Wales (2004-2012) Jane led educational interventions across disciplines at all levels, launched the world’s first MA Performance Sportswear Design, whose graduates are employed internationally and led cross-disciplinary research in Design for Ageing Well. Jane was awarded the 2003 RCA Mischa Black Award for Innovation in Design Education. Jane has published widely and continues to promote International Exchange and links with Industry in UK, Europe and China. Maureen is an illustrator and PhD Researcher with University of the Highlands and Islands focusing on the textiles of 18th century Badenoch, interpreting themes of economy, innovation and identity in the central Highlands. Maureen is growing and processing Flax at An Goirtean (Gallic - the wee field of flax) at the Highland Folk Museum. Helena was born in the Netherlands and has lived in Portugal for more than 30 years where she owns a weaving studio, producing her own range of textiles. She was 10 years a weaving teacher for the Portuguese Rural Development Association and has hosted the Erasmus for Young Entrepreneurs programme. Helena is an independent researcher at LabO, Laboratory for handwoven Canvas. Duncan is Creative Director at Earthed by William Clark with over twelve years of UK textiles experience and is the driving force behind Earthed, the nature-inspired luxury linen brand. Graduating from Dundee University College of Art and Design in 2004, his roles have included those in menswear print design, digital furnishings production and university research. Earthed won 2017 Best Fabric award at BDNY, the leading event in US for Design in the leisure and hospitality industry. Accra, the capital of Ghana is a city transformed by outside investment but one only need scratch the surface to find an ecosystem in crisis. Renee Neblett, Director of the Kokrobitey Institute in Ghana explores the role of art and design in this context and how local communities understand their environment in relation to the broader world, providing examples from the pioneering work of the Kokrobitey Institute and Design Centre. This Talk honours the memory of architect and designer Alero Olympio. Edinburgh Festival luminaries Richard Demarco and Jim Haynes are joined by emerging talents Marion Preez, Katrina Corbett, Alan Brown, Pauline Sandberg, David Seel and Oana Stanchi, gathering to recollect and plan art and design collaborations. This Gayfield Twilight Talk is presented by Pecha Kucha Edinburgh: curated by Gordon Duffy, sponsored by Studio DuB, supported by New Media Scotland and Gayfield. When creatives combine into hubs, their localities can celebrate their emergence and local economies can develop. We can map these collaborative facilities across Scotland and when we ‘join up the dots’ the term ‘creative economy’ starts to make sense as a national resource. Chaired by Caroline Parkinson, independent Creative Project manager, we hear from Creative Edinburgh’s Janine Matheson and British Council’s Lynsey Smith. Architect Gunnar Groves-Raines of GRAS presents a series of completed architectural projects as well as more experimental collaborations borne out of the British Council Maker Library Network. University of Strathclyde graduates Gunnar Groves-Raines and Stuart Falconer co-founded GRAS in 2006, an architecture and design studio exploring ideas, materials, techniques and technologies all with making at its heart. Chris Fleet and Anna Feintuck discuss Edinburgh’s cartographic industry, home to world-renowned mapmakers such as John Bartholomew & Son. Old maps of Gayfield itself suggest a bustling hub of light industry and creative manufacture. Learn more about maps of Edinburgh and the tales they tell, as well as those they choose to hide. Chris Fleet is Senior Maps Curator at the National Library of Scotland and Anna Feintuck is PhD researcher for the Mapping Edinburgh’s Social History initiative at University of Edinburgh. Glasgow-based curator Katy West (India Street, Gayfield Summer 2014) and Edinburgh-based Architect Stuart Falconer (GRAS: architects for Gayfield Creative Spaces 2014) explore their experience of working with designers and makers from different cultures and the ways in which design can both create international links and highlight local concerns. The conversation is chaired by Dr John Ennis, Founder, Gayfield Creative Spaces. Leading textile curator Lesley Millar inspires on the subject of textile design in different cultures connecting us to both place and memory and Sarah Saunders, Head of Learning and Programmes at V&A Dundee, updates on this exciting new development in the Scottish Design landscape. The conversation is accompanied by a special display of printed textiles by Professor Norma Starszakowna, innovator and educator in the field of printed textiles, based in Dundee. Alan Shaw of the Centre for Advanced Textiles Glasgow School of Art, and Geoffrey Mann Head of Glass at Edinburgh College of Art, discuss the role of digital tools in the development of their design process. Introduced by Josie Steed, Course Leader of Fashion & Textile Design, Robert Gordon University, Aberdeen. Leading UK architect Richard Murphy OBE and Professor Annie Pollock, Director of Landscape Design and Architecture at the University of Stirling’s Dementia Services Development Centre discuss the role of landscape design in creating healthy environments. Introduced by Celine Sinclair, Chief Executive of The Yard. Leading Dutch designer Piet Hein Eek, from Eindhoven, talks about the way design thinking can create a more sustainable model of living. Introduced by Amanda Game, independent curator and Creative Adviser, Gayfield. Key works by Piet Hein Eek appear for the first time in Scotland in Garden Party exhibition by Gayfield. Paul Simmons of pioneering Glasgow firm Timorous Beasties and emerging independent textile designer Laura Spring discuss their experience of creating thriving studios through design innovation and quality production. Timorous Beasties (deck chair panels) and Laura Spring (picnic hampers) feature in Garden Party exhibition by Gayfield.